Kellogg's marketing program is perennially ranked No. 1 in national surveys. The newly published Kellogg on Marketing reveals why that praise is deserved. Kellogg's new text compiles the marketing wisdom of the school's internationally respected faculty. Kellogg's prestigious marketing faculty has pooled its brain-power to create an exceptional new text titled Kellogg on Marketing filled with the collective wisdom of its contributors, including marketing legends such as Sidney Levy, Louis Stern and Phillip Kotler. Embracing the dynamism of today's information economy, these essays reflect their authors' varied interests to create a detailed map of the new marketing paradigm. "The bottom line is that markets are changing faster than marketing. Today, most company marketing strategies are obsolete!" writes Kotler in one of the book's selections titled "Reflections on Marketing." He goes on to note that the advent of computers, the Internet and wireless communication present new opportunities as well as discontinuities. In Kotler's view, marketing is becoming a shared experience between the producer and consumer. "We are noticing," he writes, "a blurring today in the distinction between products and services, between buyers and sellers, between companies and their environments." The hallmark of this book is the eclectic emphases afforded by its two dozen contributors. Familiar Kellogg names include Bobby Calder, Gregory Carpenter, Dipak Jain, John Sherry, Alice M. Tybout, Robert Kozinets and Lakshman Krishnamurthi. 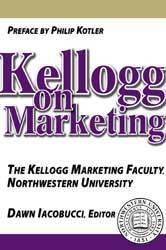 Altogether, Kellogg on Marketing offers a fascinating overview of the field. The Kellogg Marketing Faculty has embraced change and put together this book, which serves as a guide to new approaches to marketing in the information age. As Levy writes in the preface, "The diversity of the chapters and the stimulating content in the many different areas discussed are the outcome of a vibrant enterprise and will make absorbing reading for both scholars and practitioners of marketing." The book's editor, Professor Dawn Iacobucci is extremely pleased with the finished product. She says the department wanted to develop a resource that would reach all of their constituents, whether they are MBAs, executive education students, researchers or practitioners in the public business sector. In her introduction to the text she says, "We believe that in representing our different perspectives, readers will be able to garner much more and draw even more creative solutions to marketing issues than if we spoke with a single voice." Iacobucci stresses Kellogg on Marketing is not a textbook, "but rather a collection of experts' points of view about marketing theory and practice using cutting-edge research to present the latest thinking." She explains that the book frequently takes established concepts, such as segmentation, and reveals new insights into the topic. And that is exactly what Kellogg on Marketing accomplishes. The book explores a number of topics, including segmentation and targeting, market-driving strategies, understanding consumers, marketing research, market channel design and management, and pricing strategies and tactics. The text is user friendly, an accessible resource for any person interested in marketing. "Obviously the more background you have the more leverage you can gain from the chapters," Iacobucci points out. "However, marketing by nature is something everyone can relate to. We are all consumers and have empathy with the issues involved."